Researching the right to the city, Lanchonete.org worked all over Sao Paulo with a special focus on its center, and contributed ideas and questions to a range of urban themes. 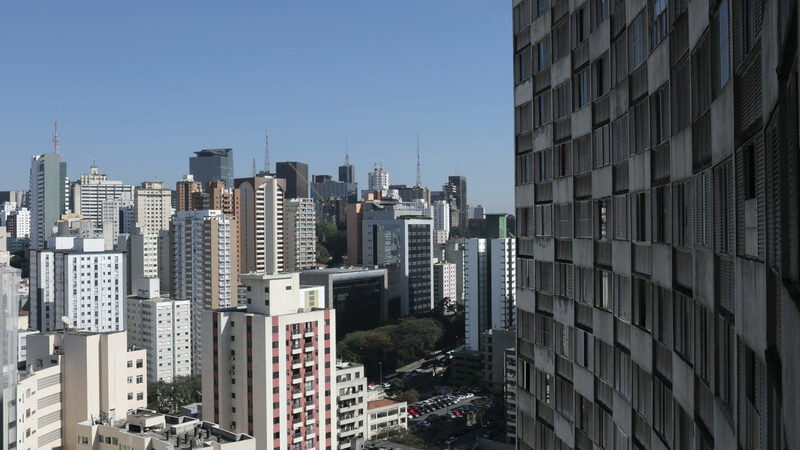 For the final two years of the five-year term (2013-17), we have had a special focus on the built environment of Conjunto Santos Dumont and the neighborhood around the lanchonete situated at the base of the tallest of its three buildings called 14 Bis. In the planning of a long-term project we have considered our growing relations at Conjunto Santos Dumont, and especially the strong partnership with Tarcisio, the bar manager for some 30 years. Indeed Tarcisio’s Bar has received many guests from the art, architecture, academic and urban ‘camps’ these past few years. Near the ‘official’ end date of Lanchonete.org, we started receiving requests by individuals and organizations to engage and/or research the project and its site. Given that the apparatus of the platform yet exists, and our desire that work–and relationships–at Conjunto Santos Dumont might continue in different forms… given that, we are accepting new ideas and advice on future directions for the Associacao Espaco Cultural Lanchonete. In 2013, artist, architect and Lanchonete.org member, Thiago Gonçalves made a food-based performance called ‘Acaraje e Gravura’ at the Sao Joao Occupation for that year’s Sao Paulo Architecture Biennial. In 2015 he retold Brazil’s migration ‘story’ with another such performance for Lanchonete.org’s inclusion in the Bamako Encounters called Manicoba (a bitter green common in West Africa and Brazil). And, in late November 2018 he conceived ‘Terroir da Paim’, a meat-drying (and eating) intervention in the internal roadway of Conjunto Santos Dumont, helping Lanchonete.org reimagine the urban planning concept of ‘charrette’ (or community consultation) and the culminating step in a series of social design encounters over the previous two years. The next step is the construction of a leisure area (including garden and lighting) for the three-building, 499 apartment Modernist structure. That is the near future.